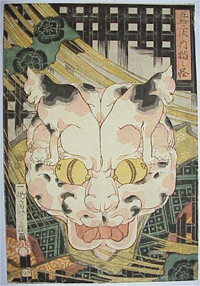 The head of the cat-witch of Okabe from the Fifty-three Stations. 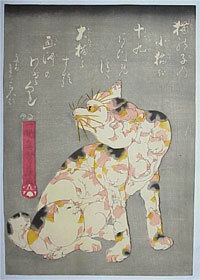 The head is composed of convoluted cats’ bodies; the eyes being two bells that are usually found round cats’ necks and the mouth a thick ribbon as worn by cats. Any young girl visiting the temple was at risk of being greeted by an old woman who would offer her accommodation for the night, only to transmogrify into a cat-witch and devour them. The print was published c 1847 by ( appropriately ) Kita. Extremely rare and a great 19th century design. Fine impression and colour. Small corner repair bottom right and slight strengthening au verso of weak lines. But generally good condition. Full size. 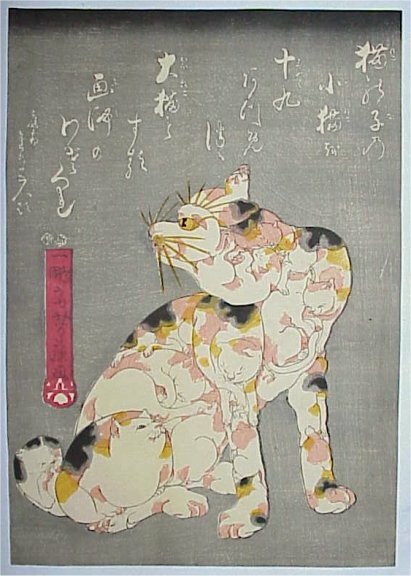 Signed Ipposai Yoshifuji ga.
An exceptionally rare print with inscription which reads: Koneko yoriatsumatte oya ni naru, “The kittens gather together and become a mother cat”. The cat’s body is formed by the convoluted forms of nineteen kittens, it’s eye is a cat’s bell and the whiskers are the spines of a fan. 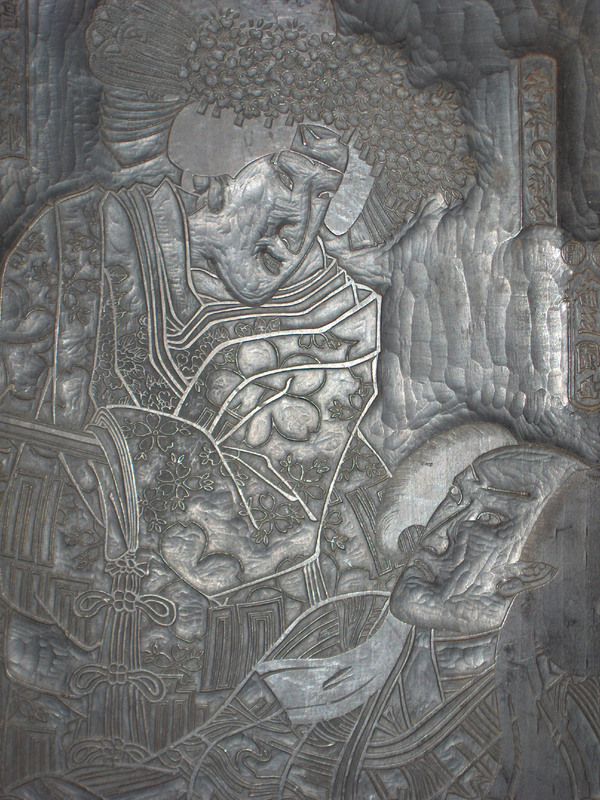 Another ( faded ) impression is illustrated in Edo no Asobi-e, Shinichi Inagaki, 1988, no 24, p 29. I have never seen another impression since I started dealing. No publisher given, c 1847-52. Fine impression and colour. Very slight trimming at left, otherwise fine. 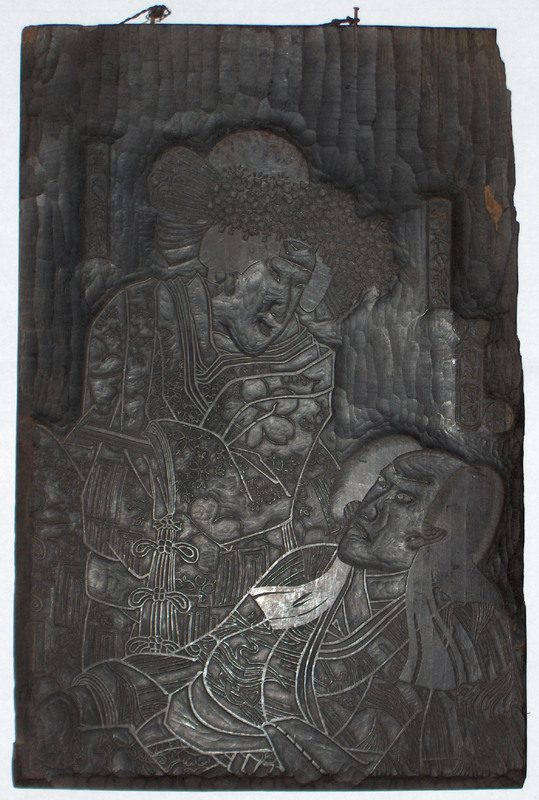 Signed Ichihosai Yoshifuji ga.
An original wood block showing actors as Kuzunoha and Abe no Yasuna. Kuzunoha was the fox wife of Yasuna and is usually depicted nursing her child or appearing as a white fox giving Yasuna the key to her disappearance in a dream. Au verso is an uninteresting design by Yoshifuji entitled Toita zukushi, a “Collection of Sliding Doors.” Rare: Blocks of seasoned wood had become expensive in the 19th century and old blocks were often planed down to be reused by later artists/publishers. 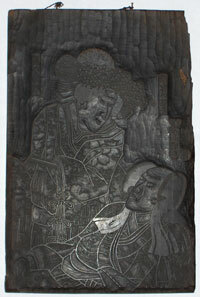 Important blocks seldom come onto the market, and the few that do are invariably for later copies. Most were reused and/or burnt and destroyed. 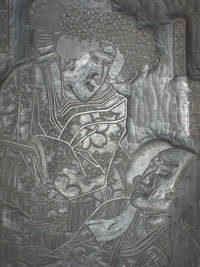 Signed Toyokuni ga. Publisher’s seal not read. Censors’ seals for 1849 – 53. Sold as is with some slight edge wormage, but otherwise surprisingly good condition.